One of the first things you are going to want to do in your WordPress blog is change your default post category. Categories are away of classifying your post so readers can find posts of interest to them. 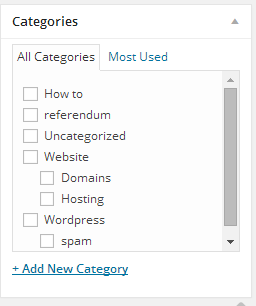 WordPress sets the default category to "Uncategorized" when it is installed, you need to change this to something that your readers can relate to. Before you can change your default category you will need to create at least one category - you can go to "How to Create a new category" to get the steps for creating a new category. To change your default post category you want to select settings from the left menu in your dashboard. Next you want to select "writing" from the sub-menu. 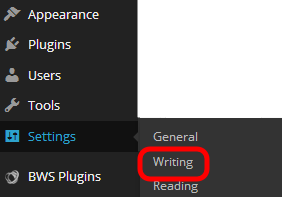 This will take you to the writing settings page where you can set your default category. On the writing screen you can set the default post category to a category you have already created, if you still haven't created any categories you will only see the "uncategorized" option and will be unable to change it, the "create a post category" will take you through the steps in creating a post category. When you have changed to the category you want to use don't forget to click on the "Save Changes" button at the bottom of the screen.